A chance conversation with Adam at Mustang Maniac about my exhaust caused me some concern and explained a point or two. Although my car is running straight out from the headers at the moment I was looking at costs for my new exhaust. Then I was asked if I had headers or the normal manifolds. I have headers that go straight to under the car. I was then asked if the steering ram was close to the headers and I explained it was. The problem here is that if headers are fitted to the block, the left hand bank of headers is so close to the powered steering ram that it damages the rubber gator. I got home looked and sure enough the was a tiny gap to the ram and headers that the rubber was indeed shot to bits and hanging off the ram. Adam had the solution with a bracket they supply for the header based cars. 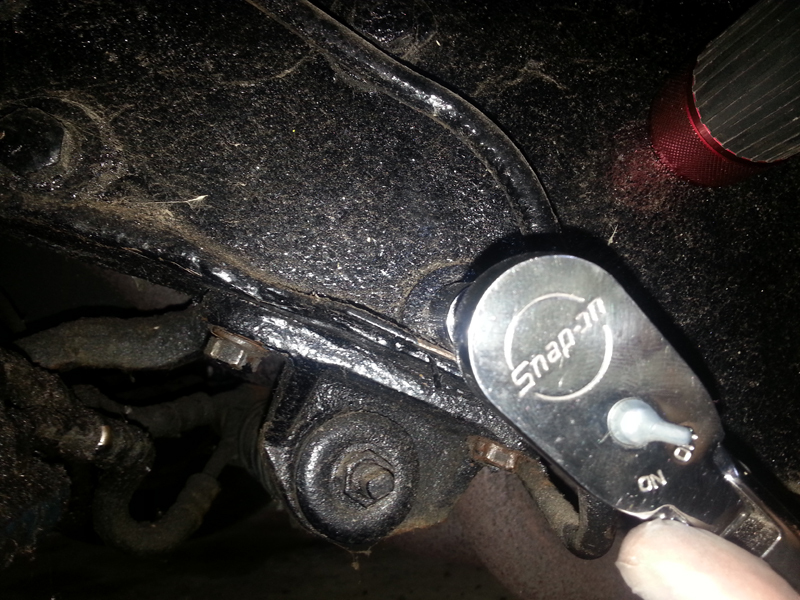 The bracket that holds the ram is a real heavy gauge bit of metal to obviously handle the pressures from the steering. There is no box, it was just a heavy bracket that I bought from Mustang Maniac. 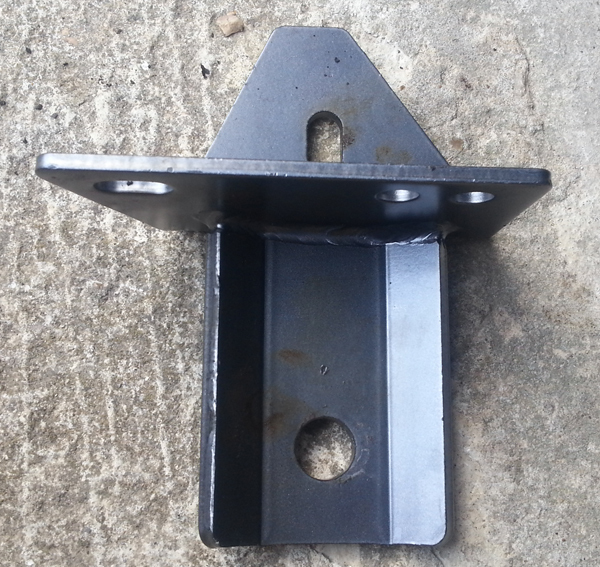 This is a bracket that is held in place by two bolts on the underside of the chassis and single long bolt that goes through the chassis held in place by a nut on the other side. The steering ram is attached to the bracket by a threaded end and rubber washers (buffers), with over large plates the same size. Before you start this job – soak the whole lot in a lubricating solution to get the bolts out and free off the corrosion. I recommend Gibbs Brand as this was the ONLY thing that would touch it. WD40 didn’t do anything nor did the Frost releasing agent. The first job I did was to loosen all the bolts by a turn or so just to make sure I had no issues. The issue I had been the main nut on the ram threaded end. There are two nuts on the end of the ram, well, one is more of a locking nut and the other is the heavier duty nut that holds the plate to the bracket. 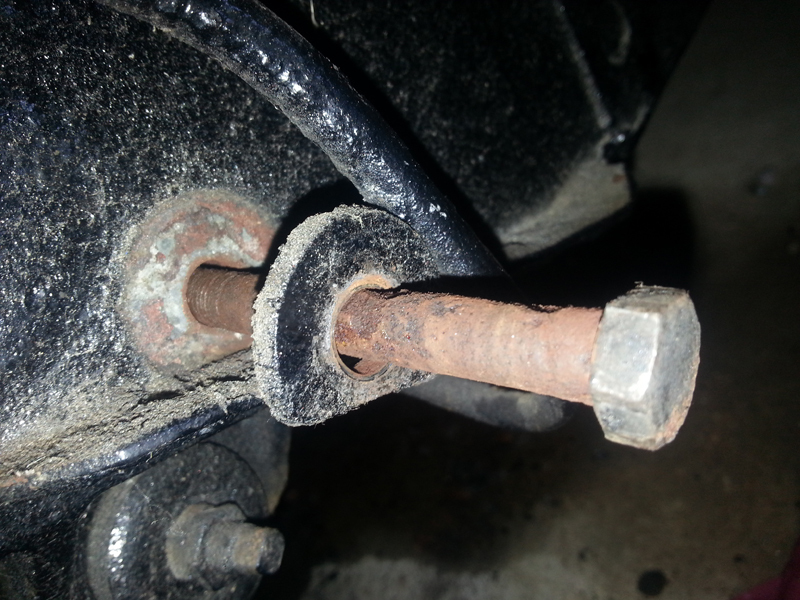 The locking nut came of no problem but the main nut would not move due to the under seal, rust and corrosion etc. This was the time I used the Gibbs Brand and gave it a squirt. On the very end of the ram is a flat which needs to be held still otherwise the ram turns in the barrel. A smaller adjustable spanner on the end was enough to stop the turn. The nut cracked open with the ring spanner in place and all was well with the world. I removed the ram from the bracket by pulling off the plate and the rubber buffer. The buffer was fine with no signs of damage and was still malleable. When pressing the ram through the hole there is a small metal collar that sits between the plates to protect the ram shaft which can be seen in the picture here. Once the ram was free it was a case of undoing the two bottom bolts and the single long side bolt. I removed the side bolt first as this was the awkward one to get to. A ring spanner and a good ratchet made light work of it. Next out was the two underside bolts, again these were just bolts into the chassis. loosening the bolts before removing the ram. Locking nut is still difficult to see on the ram. Once the bracket was off I then treated the loose rust with the FE-123and allowed it to cure. In the mean time I took some comparison pictures of the brackets together. You will notice the original has a slight indent on the location for the rubber buffers, but the new bracket does not. I cleaned up the bolts, washers and the threads and also treated with rust treatment. Once the area was cured, I loosely put the bolts in to the three locations and turned a couple of times. This allowed the bracket to be moved into place as it’s a tight fit. I tightened the side bolt up and then the bottom bolts with a final quarter turn to make sure on all of them. The ram I have put back in place but I will need a new rubber gator that’s for sure. This was a simple case of the plate on the inner side first, then the rubber buffer, then the centre collar. the other side of the bracket had the rubber buffer followed by the last plate. 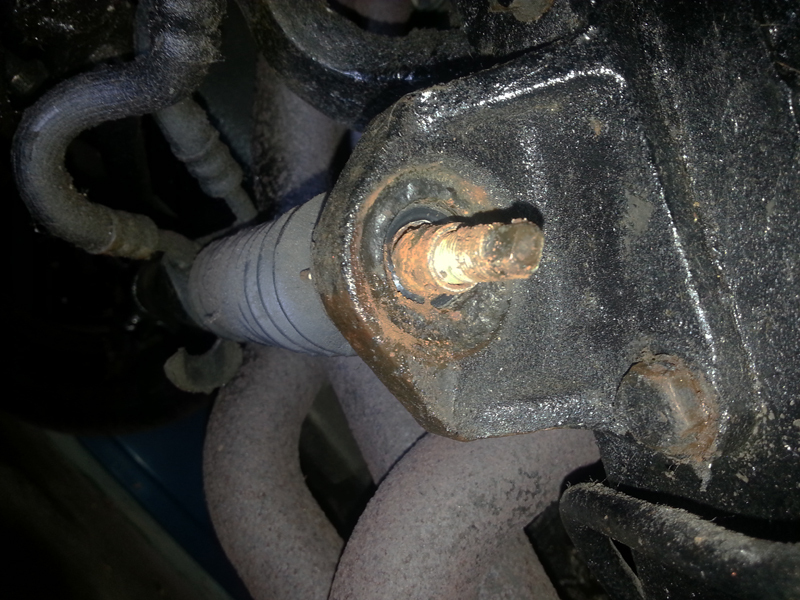 The main nut was put on and tightened and finally the locking nut onto the threaded shaft of the ram. There was with the rubber buffers. If you look at the original bracket you will see an indented area where the buffers were situated. The rubber had been squashed into that shape and the rubber had a large lip on the inside. This prevented the plates and buffers sitting on the plate squared on. With a sharp and very careful craft knife I removed the squashed out and misshapen inner part to leave a nice flat smooth surface to the new bracket without changing the dimensions of the buffer. The bracket has moved the steering ram clear of the headers enough not to foul the rubber gator now. Something that I am sure many overlook and so causes issues down the line from heat and exhaust vibration catching the gator. This was obviously what has damaged mine. Now that part of the issue should be gone. worth doing. Oh yes.